HONG KONG — Despite international condemnation of Myanmar’s campaign of violence against the Rohingya people, there have been few calls for a return to the sort of sanctions that were long a part of the country’s relationship with the West. 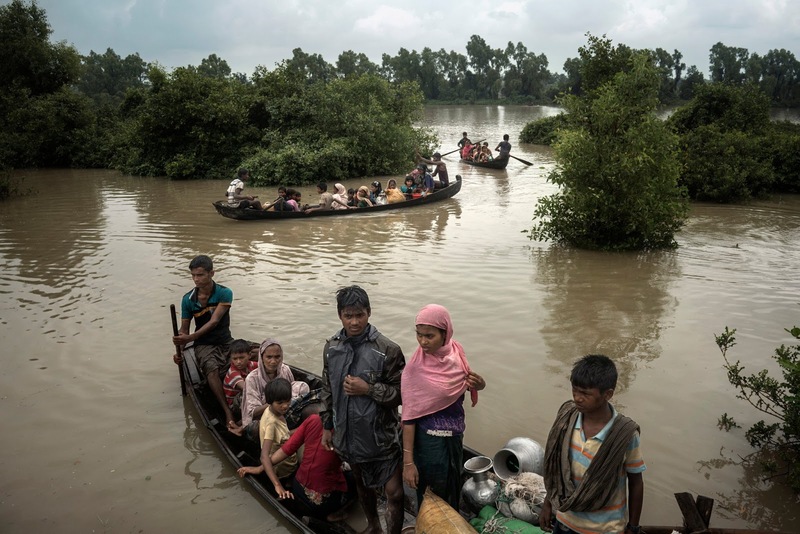 After a Rohingya militant group attacked police outposts last month, Myanmar’s military, along with vigilante groups, launched a crackdown in the western state of Rakhine, triggering a refugee crisis that has sent more than 400,000 Rohingya fleeing to neighboring Bangladesh. On Monday, Boris Johnson, Britain’s foreign secretary, led a private discussion of the Rohingya crisis among foreign ministers attending the United Nations General Assembly. Daw Aung San Suu Kyi, the de facto head of Myanmar’s government, last week decided not to attend the General Assembly, where she would likely face a flood of criticism. Mr. Johnson said nothing about whether the government of Myanmar could face sanctions. In a statement from his office, he called on Ms. Aung San Suu Kyi to take steps to halt the crisis. Myanmar’s national security adviser participated in the session, which was closed to the press. While the United Nations Security Council has the power to impose economic sanctions on Myanmar, that prospect is considered unlikely for now. The Myanmar government has said it was working with Russia and China — veto-wielding members of the Security Council — to block any efforts to punish it over the crackdown in Rakhine State. The Security Council did condemn the violence last week, its first such unified statement on Myanmar in nine years. But China blocked an effort by Egypt to add language calling for Rohingya refugees to be guaranteed the right to return to Myanmar from Bangladesh, Agence France-Presse reported. The government of Myanmar, a majority-Buddhist country, does not recognize the Rohingya, most of whom are Muslim, as citizens. With regional powers vying to gain influence in Myanmar, China’s government sees potential benefit in backing Ms. Aung San Suu Kyi and her party, the National League for Democracy, while she faces international criticism, said Yun Sun, a scholar at the Stimson Center in Washington. “Instead we gain the potential friendship” of the government, Ms. Sun said. The state-run Myanmar News Agency quoted China’s ambassador to Myanmar last week as saying his country supported the crackdown in Rakhine State. In another sign that China is drawing closer to Myanmar, last week it opened an interim liaison office in Naypyidaw, the remote city that was inaugurated as Myanmar’s capital in 2005. Most foreign missions have stayed in Yangon, the country’s former capital. China’s support for the military crackdown may be partly rooted in the recent opening of a Chinese-operated oil terminal at Kyaukpyu port in southern Rakhine State. While the military’s campaign is being carried out in the north of Rakhine, China would be concerned if the violence expanded and imperiled the terminal, Ms. Sun said. On Monday, Human Rights Watch called for targeted sanctions against Myanmar’s military. It also called for new restrictions on the sale of arms to the country. For decades, Myanmar — or Burma, as it was formerly known — was one of the most isolated countries, with the United States and other Western countries enforcing sanctions against its military-led government. But as the military has gradually released some of its political control, the country’s interactions have grown dramatically. The European Union and the United States pulled back broad sanctions after elections in 2012. Then last year, President Obama dropped sanctions on aid from Washington to the government of Myanmar, as well as restrictions on several dozen people with ties to the former military government. That move was made in recognition of the advancement of democracy in Myanmar. But human rights groups worried it would also reduce the leverage the United States had to try to curb abuses against the Rohingya. Last week, Senator John McCain of Arizona said he would remove language from a defense-spending bill that would fund cooperation between the militaries of the United States and Myanmar. Mr. McCain has called on Ms. Aung San Suu Kyi to do more to help the Rohingya. Ms. Aung San Suu Kyi, who was awarded a Nobel Peace Prize in 1991 for her long struggle against military rule, has many fans among lawmakers around the world, and that may insulate Myanmar from more serious censure from the United States and other governments. The Senate majority leader, Mitch McConnell of Kentucky, said last week that “publicly condemning Aung San Suu Kyi, the best hope for democratic reform in Burma, is simply not constructive.” He noted that under Myanmar’s Constitution, she is barred from the presidency and her civilian government has no authority over the military. Her position is “an exceedingly difficult one,” he said. 0 Response to "Despite Outrage Over Rohingya Crisis, Few Call for Sanctions on Myanmar"